The Bear Anarchy Continues To Roar! 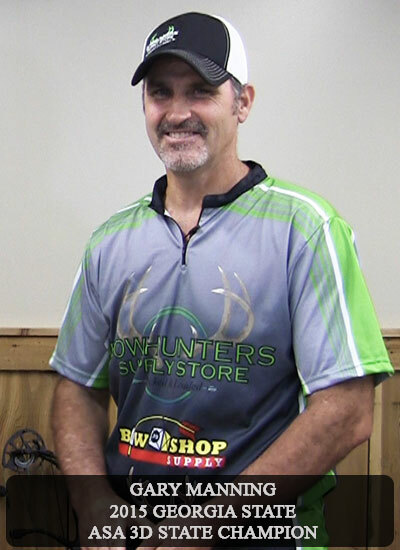 Congratulations to Gary Manning for placing in the top 5 at the Cullman, Alabama ProAm ASA shoot in the Bow Novice category out of 105 shooters. Gary shot a 424 with 15 12’s. Hit the Target with this special deal! Don’t delay, this offer expires on Friday, July 24, 2015! Chris Powers interviews Gary Manning. Gary is now the 2015 Georgia State ASA 3D State Champion. Gary became a winner with a Bear Anarchy from Bowhunters Supply Store, get yours today! Click here to view all of our Bear Anarchys. The 2015 Georgia State Championship will be at Sweetwater Archery Club this Saturday, July 11th and Sunday, July 12th. The Shoot will open both days at 8:00 a.m. Saturday, July 11th, the cut off for sign in will be at 3:00 p.m.
All score cards will need to be turned in by 6:00 p.m. Sunday, July 12th, the cut off for sign in will be 1:00 p.m. and the score cards must be turned in by 4:00 p.m.
We will have 4, 15 target ranges, 30 known and 30 unknown. Most all will shoot 30 targets for a compete score of 300 (hopefully). We will follow all ASA rules and classes. Hudson’s BBQ will be hosting the concession stand and will have BBQ, hotdogs, chips and drinks. Come on out and shoot for fun or class, bring your family and friends and we look forward to seeing you there!